Always the appearances were deceiving. The frog emerges from visible stages of amphibian transformation and there is also a step-by-step process that is invisible to the eye. Hidden from view, the nitrogen base pairs of nucleic acids to the chromosomes that enable frogs and all living things to survive this intricate, yet inherited process. "Not that long ago, biology was considered by many to be a simple science, a pursuit of expedition, observation and experimentation. At the dawn of the twentieth century, while Albert Einstein and Max Planck were writing mathematical equations that distilled the fundamental physics of the Universe, a biologist was winning the Nobel prize for describing how to make dogs drool on command." "The molecular revolution that dawned with the discovery of the structure of DNA in 1953 changed all that, making biology more quantitative and respectable, and promising to unravel the mysteries behind everything from evolution to disease origins. The human genome sequence, drafted ten years ago, promised to go even further, helping scientists trace ancestry, decipher the marks of evolution and find the molecular underpinnings of disease, guiding the way to more accurate diagnosis and targeted, personalized treatments. The genome promised to lay bare the blueprint of human biology." "That hasn't happened, of course, at least not yet. In some respects, sequencing has provided clarification. Before the Human Genome Project began, biologists guessed that the genome could contain as many as 100,000 genes that code for proteins. The true number, it turns out, is closer to 21,000, and biologists now know what many of those genes are. But at the same time, the genome sequence did what biological discoveries have done for decades. 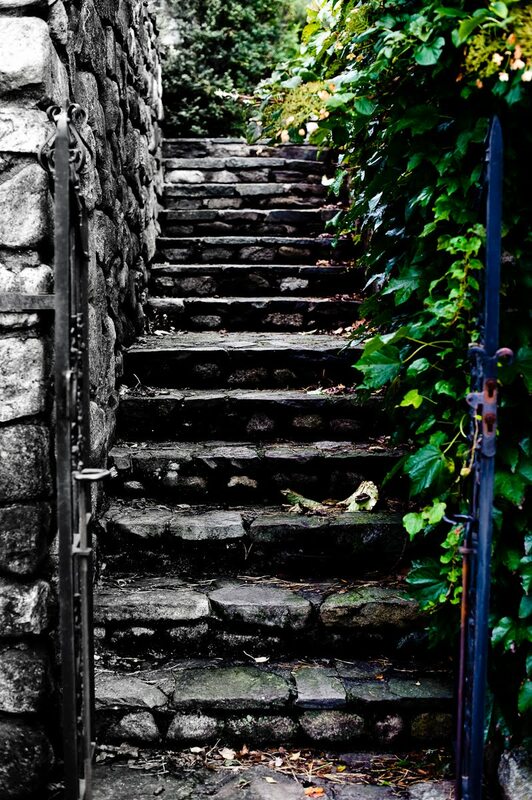 It opened the door to a vast labyrinth of new questions." "Few predicted, for example, that sequencing the genome would undermine the primacy of genes by unveiling whole new classes of elements — sequences that make RNA or have a regulatory role without coding for proteins. Non-coding DNA is crucial to biology, yet knowing that it is there hasn't made it any easier to understand what it does. "We fooled ourselves into thinking the genome was going to be a transparent blueprint, but it's not,"
says Mel Greaves, a cell biologist at the Institute of Cancer Research in Sutton, UK. Instead, as sequencing and other new technologies spew forth data, the complexity of biology has seemed to grow by orders of magnitude." "The Human Genome at Ten," 2010 Nature. "The origin of life was the origin of true heredity; we might even say the origin of life was the first gene. . . . By the first gene I mean replicator. A replicator is an entity, for example a molecule, that forms lineages of copies of itself. There will always be errors in copying, so the population will acquire variety." Richard Dawkins, The Ancestor's Tale, (2004). p. 563. In October of 1977, Sir Peter Medawar, a famous biologist wrote that "the greatest scientific discovery of the twentieth century" is "without qualification," the explanation of "the chemical makeup of the compound deoxyribonucleic acid (DNA)." The discovery that revealed a hidden layer of existence. James D. Watson, a codiscoverer of the nucleic acid code, had himself written, in 1980, that the "double helix . . . would revolutionize biology." Rosalind Franklin, Maurice Wilkins, Francis Crick and James Watson competed with Linus Pauling in a race to discover how proteins were built from DNA and how the structure of the nucleic acids or DNA assists in the creation of amino acids that code for specific proteins. Each of these participating units: DNA, amino acids, and proteins are together, all involved in the hereditary processes of living organisms. The study of heredity from a biological perspective has been called genetics for just over a century, since 1900. Genes are not quite as precise as the word may imply. The molecular configuration of nitrogen bases that comprise nucleic acids such as DNA & RNA are the "replicators" needed for life. Another means to portray configuration of nitrogen bases in relation to the five carbon sugars and phosphate linkages. 1909, Wilhelm Johannsen, coins "gene; genotype & phenotype"
1944, Erwin Schrödinger's published What is Life? 1948, Dorothy Hodgkin uses x-ray crystallography to investigate protein structure. 1951, The immediate discovery stage commenced with discovery of the alpha-helix structure of proteins. 1953, DNA's structure determined after a race of four researchers to beat Linus Pauling to the answer: Francis Crick, James Watson, Maurice Wilkins, and Rosalind Franklin. 1961, Alexander Rich a biophysicist at MIT accurately shows that "that two single-strand ribonucleic acid (RNA) molecules could spontaneously align themselves to form a double helix," as a necessarily crucial partner in the processes of inheritance and metabolism. 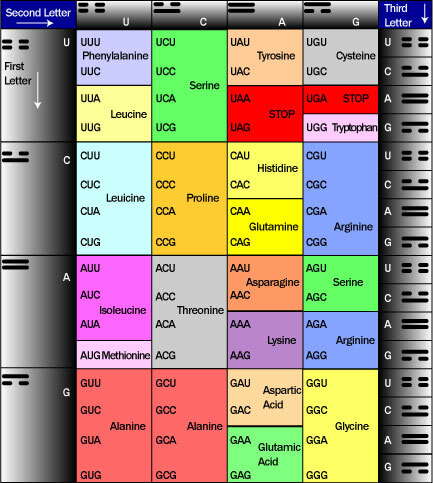 1967, Charles Yanofsky and coworkers reveal definitively that the sequence of nitrogen bases (codons along a chromosome) determines the sequence of amino acids in a protein. Zeitgeist is the "spirit of the times" and was characterized by a belief in the evolution of life. Darwin's publications and "a democracy of descent"
Spectroscopy, 1859-60, cesium & solar spectrum. Darwin studied breeding by artificial selection and the production of variation, but could not, as yet determine the units of hereditary processes. Mendel and breeding variations in domesticated pea plants identified the outcomes of deliberate crossing of varied plants but could only speculate concerning the particulate material that was inherited by daughter generations from their ancestral line. His work was ultimately forgotten & but rediscovered. Muller with his agronomic chemistry research & Bateson rediscover Mendel's work. Morgan and the study of chromosomes in fruit flies. x-rays – are extremely high energy electromagnetic radiation and they expose the underlying structure of the calcium containing bones of the body. ultra-violet rays – are high energy electromagnetic radiation beyond the visible range. Rediscovery of Mendel's suppressed work by Hugo de Vries, advocate of mutation theory of speciation. A string of beads were the homiletic imagery (like rosary beads) that Mendel figured were the material "germs," or seeds within seeds" that made up the inheritable materiality because the word "genes" did not exist. codon–a section of nucleic acid that makes a protein unknown to Mendel. Over time traits survive from one generation to the next that assist organisms in acquiring and digesting food, shelter, nesting sites, security & reproductive success; ... after artificial selection of breeders, Darwin and Wallace called this natural selection. Barbara McKlintock's work with "jumping genes" were a focus of research due to their relative ease of study. Eugenics was a social program in the late nineteenth and early twentieth century to remove diseases and disabilities from the reproductive population. Problems arose when certain traits associated with isolated ethnic groups were used to sterilize emotionally disturbed and mentally disabled people. Some who favored eugenics did so because they were racially biased against minority ethnic groups such as Africans and Armenians. The racist strain of ethnic prejudice, soon led to eugenics policies and practices directed by Europeans against Asians, Africans an native Americans. Social Darwinism, ethnocentrism, & public health in some sense converged to substantiate xenophobia and fear of ethnic minorities or ethnic majorities in Africa and Asia where European colonies were threatened by insurrection and rebellion. imprisonment, sequestration and sterilization of insane persons and less powerful ethnic groups called "inferior races." 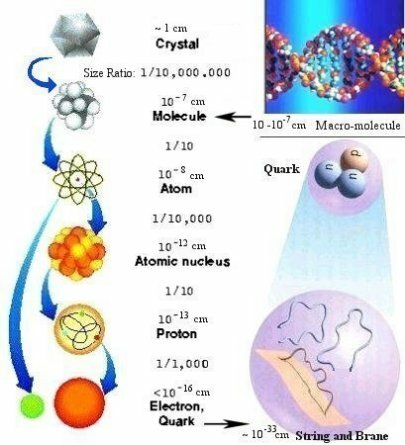 existing between the different cellular – nucleo and molecular levels or scales of material existence. chromosomal (stained body) information in code. Chemistry, phage study (viruses), purines & pyrimidines are found in cell nuclei–later purines and pyrimidines are are molecules made of nitrogen base pairs. Double helix -- DNA is comprised of a set of nitrogen bases (4); a sequence of three nitrogen base pairs are what code for an amino acid; held together by five carbon sugar and a phosphate group of molecules. There are three related fields based on levels of complexity necessary to understand genetics. series of specific amino acids code for proteins and these proteins are essential to all life! 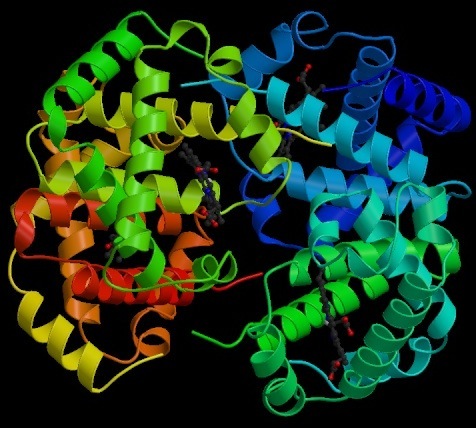 1955, structure of the protein insulin is described; Severo Ochoa discovers that cellular energy is stored in phosphate bonds & that an enzyme produces RNA in the laboratory! Adenine and nitrogen base bonds with phosphate to carry energy and store energy on the microscopic, cellular or molecular level. Over time traits survive that assist organisms in acquiring food, shelter, security & reproductive success... Darwin and Wallace called this natural selection. 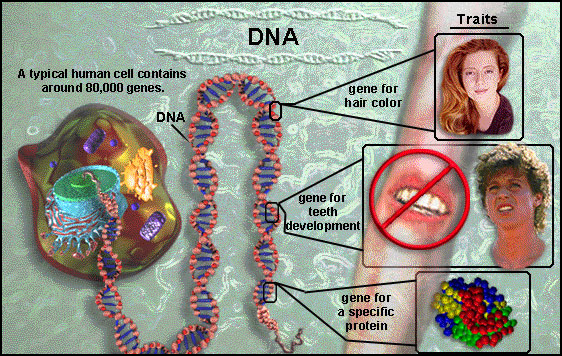 DNA & RNA are the genetic code found in 23 chromosomes. 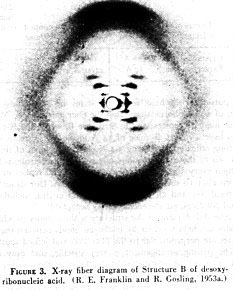 The Double Helix, James D. Watson (Mentor, 1968), p. 143. DNA & RNA are the ingredients in a complex genetic code. They are the basis –or particulate macromolecules– for the proteins, enzymes, hormones and recognizable traits. DNA is found in all 23 pairs of chromosomes (all the strands together comprise the human genome). The human genome is actually the equivalent of 6 billion pages of instructions for engendering a living human. Fully one third (1/3) of the genome codes for parts of the central nervous system. Chromosomes are long coiled strands of nucleic acids because they are found in the cell's nucleus; a walled in security sphere or bubble where inherited information on building proteins are stored as nucleic acids or DNA. 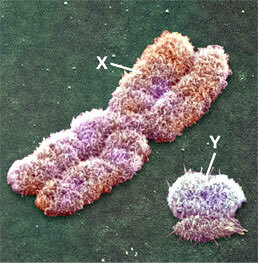 Upper left are chromosomes' images which are shown on lower right to be coiled around histones (a type of protein). Nitrogen bases are found in all nucleic acids and were earliest identified in the nuclei of cells where chromosomes –dark staining bodies– were found from the investigation into variation based on fruit fly studies. Because fruit flies have large chromosomes that are easier to identify microscopically, these studies shaped early genetic research into nucleic acids. Nucleic Acids are both DNA (in double helices) & RNA. DNA is variable due to the sequential ordering of four nitrogen bases, A, T, C, G, (T is replaced by U in RNA). The "sleuths in the search"
The Double Helix, James D. Watson, (New York: Mentor, 1968), 29 Chapters, p. 143. "The genome is is the entire set of genetic instructions in the nucleus of every cell. (In fact, each cell contains two genomes, one derived from each parent: the two copies of each chromosome we inherit furnish us with two copies of each gene, and therefore two copies of the genome.) Genome sizes vary from species to species. From measurements of the amount of DNA in a single cell, we have been able to estimate that the human genome –half the DNA contents of a single nucleus– contains some 3.1 billion base pairs: 3,100,000,000 As, Ts, As and Gs." "in each, it is the DNA that oversees the extraordinary transformation from a relatively simple single cell to the stunningly complex adult of the species,comprised, in the human instance, of 100 trillion cells." James D. Watson, , pp. 165-66.
codify, describe, diagrammatically detail and examine the 4 billion genes of the 46 human chromosomes. Meades original definition in 1924: (Search for Solutions). translation from verbal (linguistic) to visual (graphical). Freeman Dysons global application (Infinite in all Directions). (thermostat as templates a double translation of visual and verbal to graphical to model). (verbal translation to graphical representation that is both analytical & synthetic). Phenotype-- the expression or external appearance of inherited traits: complexion, eye color, dentition, hair color, blood type, immune response, etc. Genotype -- the underlying base pair sequences that together form the gene that codes for proteins, structures, hormones, enzymes, or neurotransmitters in the body of all living things. 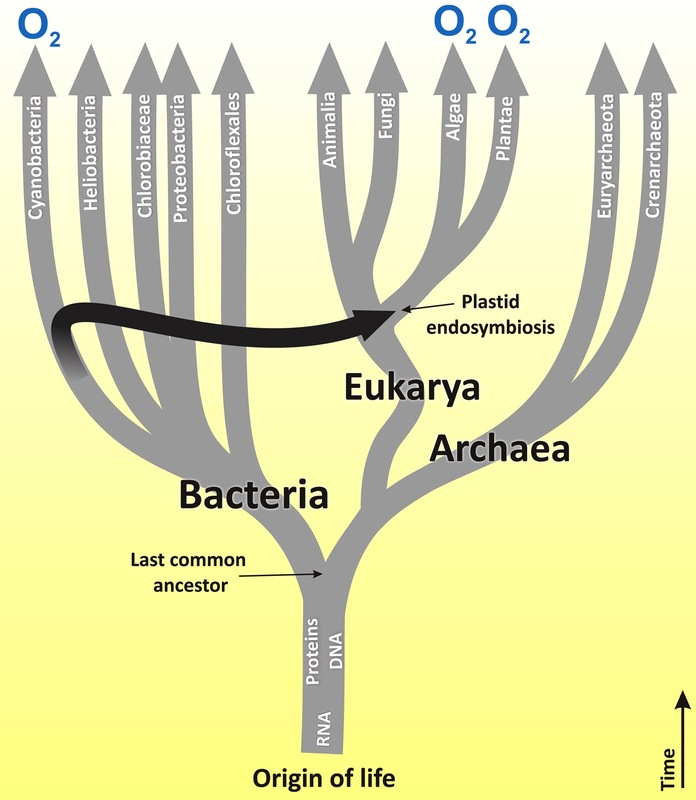 In Eukaryotic organisms this genetic material is usually in the nuclei of cells, but the maternal line of inherited material can be traced in the mitochondrial DNA. Nitrogen base pairs make up the RNA and DNA polypeptide chains (long molecules). Crucially significant and related molecules. ATP, or adenosine triphosphate, shown above, is a molecule that stores energy for cellular metabolism. Important biologically active molecules form proteins. The structure of the hemoglobin protein –an active ingredient found in blood– reveals that numerous alpha-helices, or single strands of helical molecules are folded into a precise scaffold that allows the protein to embed a porphyrin ring in its interior. The shape of a protein allows it to function precisely as it does. "Every protein is synthesized according to instructions contained in DNA." In retroviruses the instructional transfer is reversed and goes from RNA to DNA, instead of the other way around. "It takes three pairs to specify an amino acid." 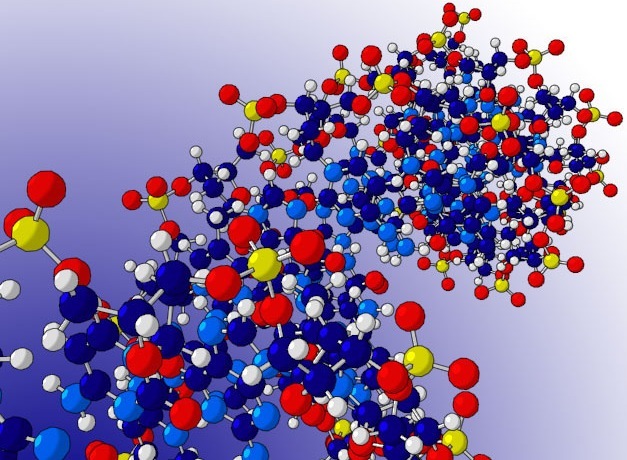 Amino acids in long strings fold to make complex proteins that regulate bodily performance, function and development by making catalytic enzymes, markers or pheromones, and signals or hormones that direct responses of organs and organ systems throughout the body. "Junk DNA got its name because the nucleotides there do not encode instructions for making proteins, the basis of life." the vast material in organisms from bacteria to mammals consists of non coding DNA segments, which is interspersed with coding parts. In humans, about 97 percent of the genome is junk." "junk DNA contains three to four times the redundancies of the coding segments." "it takes three Nb pairs to specify an amino acid"
A stretch DNA or RNA that specifies an exact amino acid sequence is called a codon. Genetic counseling for carriers of disease causing genes. progesterone -- genes that code for this protein ultimately influence the menstrual cycle and that cycle directly influences the reproductive potential. estrogen -- receptors for this protein are found in both sexes but influence many female traits. epinephrine -- is involved in fight or flight responses of creatures to stress, fear, and adaptation. Dr. Charles Sing, University of Michigan. "Genes don't wake up [phenotype] until they are exposed to some environmental factor." "the presence of a genetic marker . . . is no guarantee that abnormality or disease will show up." Recombinant "genii loci" for micro-engineering or Frankenstein monster with a Faustian bargain? Critic, Jeremy Rifkin; genetic engineering is unwise and too risky. Defender, James Watson; gene therapies offer us a chance to retard crippling diseases. The vocabulary of modern inheritance is confusing and because it is so specialized includes three or more levels of material organization beyond our comprehension because we can not see to such depths of the organic structure we call nature. A dozen layers of complexity were revealed by scientific research from which life in the cosmos arises. Up to the top of the stairway of order, because they can be very big. 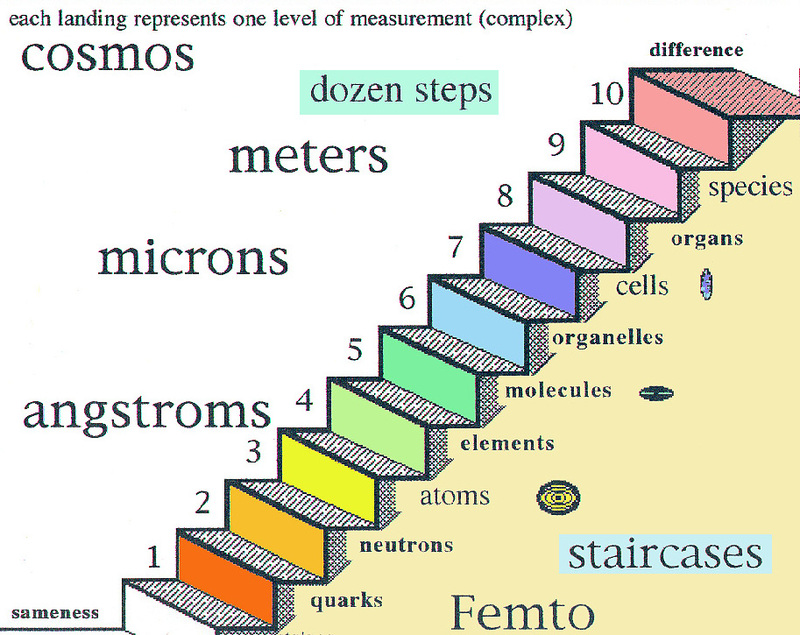 Bottom of the stairway of order, because they are very, very small. What exists at the bottom of material reality? C H O P K I N S' Ca Fe or ( C. Hopkin's Cafe ). Three base sequences code for amino acid, the building blocks of proteins. Proteins, catalysts, hormones; the micro machinery of life. The way proteins fold is critical to their proper functioning. Cells normally have DNA in the organelles and packed into the nucleus if these are Eukaryotic cells. Up to the top of the stairway of organic order, eukaryotic cells when compared to prokaryotic cells can be very large because organelles are of a similar size to cells of typical prokaryote organisms. Modern sciences worldview of evolutionary continuity as the descent from a common species. There is an ongoing unfolding of organization as the universe ages, but hereditary change differs from physical changes over time. The stars evolve and supernova --- are ------> creating all 119 elements such as the nickel & iron that are Earths molten core. The earth evolves –– plate tectonics ----------> creating Continents & Oceans. Varied habitats evolve due to sedimentation & erosion. Biological creatures all have an hereditary lineage that may gradually adjust to abruptly changing habitats within a narrow range of opportunities. Life by means of natural selection changes into divergent forms. "Summa Geneologica" with apologies to Thomas Aquinas. "The key to true heredity is that each replicator resembles the one from which it was copied more than it resembles a random member of the the population. The origin of the first such replicator, was not a probable event, but it only had to happen once. Thereafter, its consequences were automatically self-sustaining and they eventually gave rise, by Darwinian evolution, to all life." The molecules of carbon, phosphorus, nitrogen and sulphur are at the very foundation of what we now know as inheritance, or properly the science of inheritance that is a branch of biology called genetics. Built over 170 years since Buffon and Lamarck noted the tendency of varieties of plants and animals to share common structural and functional anatomical features, the science of inheritance went through conceptual, experimental, rediscovery and redefining stages that led to remarkable realizations due to technology that was unavailable to the 18th century thinkers who proposed the inheritability of certain abilities from one generation to the next. This is a story where appearances are deceiving because of the antiquity of the hereditary processes involved, the complexity of the relationships among chromosomes, enzymes, and proteins, not to mention a stifling role of persistently rigid beliefs that often overshadow to the extent that they ignore the findings of experimental research. What is wrong with the term genes? "The Human Genome at Ten," 2010. Published online 31 March 2010 | Nature 464, 664-667.